Omeros Research Papers discuss a poem by Derek Walcott about a love triangle. 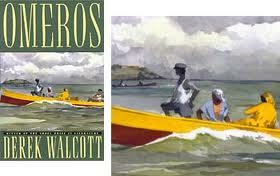 Omeros, the Caribbean epic poem by Derek Walcott, depicts a traditional love triangle between Hector, Achille and Helen. Have a character sketch done on any one of the characters within the poem. You can also order a project on Omeros on any topic that you have been assigned; our writers custom write every project to your exact specifications. Hector and Achille compete for Helen’s sexual attentions, which she is apparently comfortable sharing with them. Hector and Achille get involved in a terrible fight in a rum house, fighting like madmen over Helen. From the descriptions of Helen’s physical appearance and demeanor, one can understand how men might find her dangerously alluring, to the point where they might fight to the death over her. Her effect on men (and women) was often like this: “I felt like standing in homage to a beauty that left, like a ship, widening eyes in its wake…As the carved lids of the unimaginable ebony mask unwrapped from its cotton-wool cloud, the waitress sneered, “Helen.” And all the rest followed”. When Helen got into an altercation with Achille because he insisted on carrying a bag for her, she nearly scratched his eyes out and sent him on his way. Achille has always been drawn to Helen’s dangerous side: “I saw the rage of her measuring eyes, and felt again the chill of a panther hidden in the dark of its cage that drew me towards its shape as it did Achille”. Achille then experienced sunstroke, and in the moments when he was in a dream state, his dream sequence took him through history to discover his roots. Back to Africa, then, he found his father, Afolabe. He comes to know the horrors of the slave trade. When he recovers, he wants to name Helen’s unborn child an African name. She, however, had not traced her history as he had. History did not matter to Helen, because she lived in the present, complete unto herself. The Trojan War comes down to us from antiquity largely from myths and legends now lost. Paper Masters writes custom research papers on Omeros and discuss a poem by Derek Walcott about a love triangle.